Ordered in spring 2012, construction of the first Rupert 80 motor yacht is well under way at Rupert Marine. Her composite hull was popped out of her mould, bulkheads are in place, and the interior is built in parallel. The Rupert 80 semi-custom series will become the flagship of the Swedish yard when launched. Conceived by Thomas Rönnberg, founder and owner of Rupert Marine, this 25 metre motor yacht has an aggressive and low profile designed by Ted Mannerfelt with a naval architecture by Petter Hakanson. Rönnberg says: ‘When I talked to my designer I told him that it has to be a workboat with a superyacht finish and styling’. The interior, by Nauta Design, comes in two versions: two cabins for four guests, or three cabins for six guests. Crew quarters are for two. The first hull will also have the galley on the main deck, but a layout with the galley below is available. In the engine room, four options are possible: twin 900hp Volvo Penta IPS version with speeds between 30 and 34 knots, triple 900hp Volvo Penta IPS version with speeds between 34 and 40 knots, a twin 1200hp MAN waterjet version with speeds between 38 and 43 knots, and a twin 1400hp MAN waterjet version with speeds between 40 and 46 knots. The maximum range could exceed 850 nautical miles at an economical speed of 20 knots. 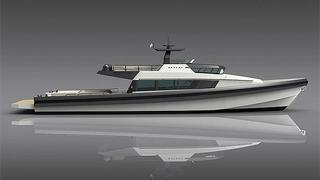 The first Rupert 80 motor yacht will be delivered, as scheduled, in summer 2013.